When You Think Eyes, Think Complete Family Eye Care! Complete Family Eye Care is a proud member of North America's largest network of independent Optometrists. We use the latest in diagnostic technology to diagnose and treat eye conditions ranging from allergy and dry eye to glaucoma and diabetes. We also stock contact lenses, designer eye glasses, and frames. Since 2001, Complete Family Eye Care’s friendly Optometrists and staff have helped patients in Corpus Christi achieve and maintain clear vision. 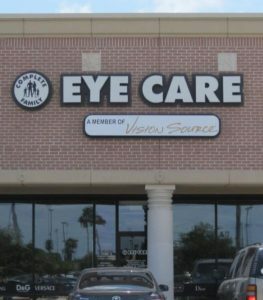 Our experienced Optometrists provide comprehensive vision exams at our Southside Corpus Christi office. At Complete Family Eye Care, we specialize in using cutting edge technology to diagnose and treat of a wide array of eye diseases, conditions, and problems. We remain committed to improving the quality of life and vision for people in Corpus Christi and surrounding areas. Give yourself and your family the gift of clear sight. Schedule an appointment with an Optometrist at Complete Family Eye Care today!